The human products of public moocher and rogue Nevada rancher Cliven Bundy's seed are causing a ruckus in Oregon. Bundy's sons, Ammon and Ryan, are leading a group of approximately 150 insurrectionist terrorists who have taken over a federal wildlife preserve near the remote town of Burns, Oregon. As I suggested in a piece at Salon, if these people were Muslim or black they would be dead. The State would have called down merciless violence to immolate the "terrorists" or "radicals". The corporate news media would have supported this narrative. Fox News would be insane with rage and fear about "black thugs and militants" as well as "Muslim terrorists" who are Americans that were somehow "radicalized" by "extremists". White privilege is a universal tool, a Swiss Army knife of sorts in American life. The behavior of Bundy's Brigands--and the State's deescalation and non-response--is just one more sign of what most reasonable and intelligent people already know. 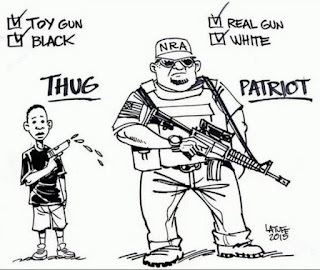 There is a powerful editorial cartoon which highlights the hypocrisy of white privilege and the color line that is exemplified by how a 12-year-old child named Tamir Rice was executed in the street by the Cleveland police for the "crime" of playing with a toy gun while white men who are armed with real assault rifles and make terrorist and insurrectionist threats against the federal government go unharmed. 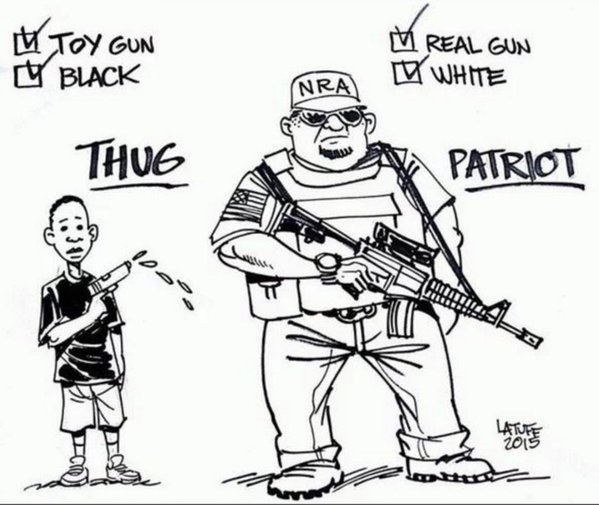 150 armed white men who take over federal property in Oregon are "patriots" or a "militia" while 1 black kid with a toy gun named Tamir Rice is a "threat" who is killed in less than 2 seconds by a cop. My Facebook link has since gone viral with tens of thousands of "likes" and "shares" since Sunday afternoon. As such language often does, the sentence "Sometimes it is just that simple" obscures more than it reveals. The divergence in how the State treats black and brown people as compared to white folks is very real. White privilege in this context does (quite literally) determine life outcomes and life chances. But, white privilege also intersects with other categories of identity as well. In all, white privilege--as an extension of how white supremacy functions in a quotidian manner--is part of a racist American (as well as global) culture. White privilege has protected Bundy's Brigands in Oregon from violent retaliation by the State. Bundy's Brigands are also protected because they are Right-wing products of the Republican Party and the Fox News hate media echo chamber. If Bundy's Brigands were liberals or progressives they would be treated very differently by the United States government and the corporate news media. Bundy's Brigands are also white men with guns. White ammosexual identity is protected by the National Rifle Association, the Republican Party, and the Right-wing media. These gun deviants are given the honorifics of "patriots" and "militia members". Bundy's Brigands are also an example of how certain economic interests are protected in America. If this group of terrorist insurrectionists had staged their "standoff" at Wall Street for example, they would have been beaten up, arrested, and disappeared by the police, private security forces, and the Federal Bureau of Investigation. The rhetoric of capitalism and the iconic and empty Americana images of the yeoman farmer and cowboy are also operative in the "Oregon Standoff" as well. If Bundy's Brigands were talking about fighting for a more fair and equal democracy, forming grange organizations, people's economic collectives and banks, or how corporate farms and the 1 percent have stolen public resources to fatten their own wallets, the response by the State and the media would be very, very, different. Those "radicals" would still be above ground--maybe--but they would not be free people. Bundy's Brigands are beneficiaries of several types of privilege. White privilege is the most central and important of their unearned advantages and life opportunities. But, to truly understand race and the color line in a sophisticated way, we must also take an accounting of power and inequality as a system of relationships and being cautious of being too narrow in how we analyze society and politics.